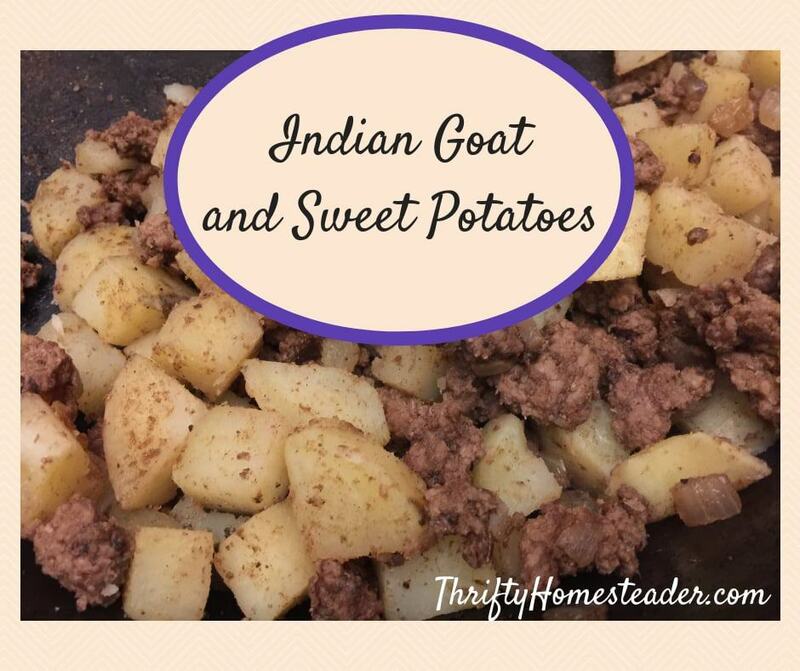 Although you can use goat meat in place of beef or pork in your usual recipes, I don’t really like to do that. When I eat chili, for example, I expect it to taste like pork. If it tastes like goat, I just don’t like it. 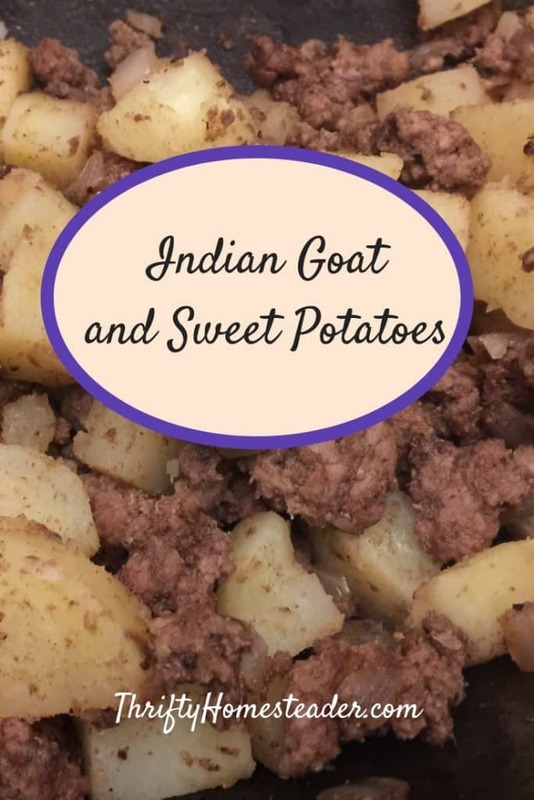 I greatly prefer recipes that come from parts of the world where people eat goat regularly. And it makes sense that they would have figured out which spices and cooking methods work best to complement the goat flavor. 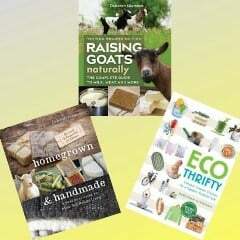 This recipe, which is included in both editions of Raising Goats Naturally, became a fast favorite! The garam masala spice blend is the key. You can find it online through my affiliate link or at most local stores. If you can’t find it locally and don’t want to wait for it arrive from an online order, you can mix up cardamon, cinnamon, cloves, cumin, black pepper, and coriander. If you’re missing one of those spices, you can still make a very tasty dish with the remaining spices. If you don’t have your own homemade goat milk yogurt, you can substitute plain store-bought yogurt. When traveling, I’ve had this with sheep yogurt, and it’s delicious. If you’ve never seen white sweet potatoes before, you may think that there is some kind of mistake here. But nope, those are Hannah sweet potatoes, which we peeled, but they have a brown skin. Japanese sweet potatoes also have white flesh, but they have red skin. You can also find sweet potatoes with purple flesh and skin. We’ve used every type of sweet potato that we could find, and they all work great with this recipe. However, the Hannahs are my favorite. This recipe is gluten-free and paleo. This post contains affiliate links. This means that if you purchase something after clicking on a link, Thrifty Homesteader will earn a commission while you still pay exactly the same amount as you otherwise would. This is one way that we are able to continue providing you with free content, such as this article. Chop the sweet potatoes into 1-inch cubes. Put them into a 2-quart pot and cover them with water. Boil the sweet potatoes for 20 minutes or until a fork inserted into a cube breaks it in half easily. Chop the onion and begin browning it in oil. Add the ground goat, salt, coriander, and garam masala. Stir the meat frequently to prevent burning until it is cooked thoroughly. Add the cooked sweet potatoes to the pan, and stir the cubes into the meat mixture. In a bowl, mix together the yogurt, lemon juice, and garlic. 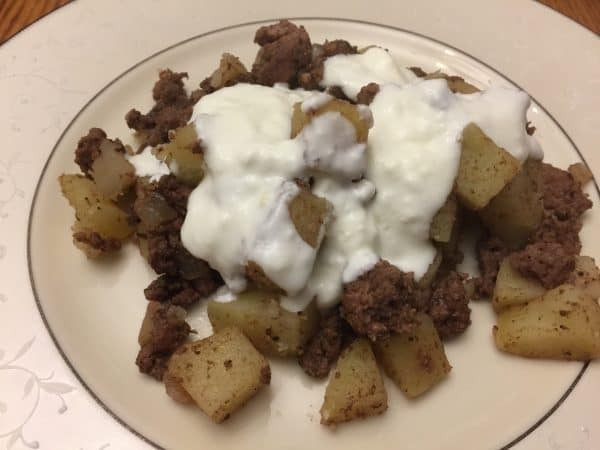 To serve, put the meat and sweet potato mixture on a plate and drizzle it with the yogurt sauce. 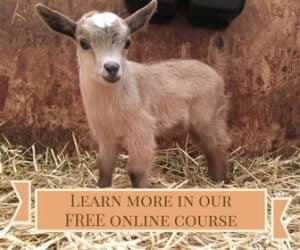 More Goat Recipes Please … Healthy Meat … I raise My own . Awesome! And thanks for the feedback!